Provide comfort for the family of German Alvarado with a meaningful gesture of sympathy. German Alvarado, age 82, passed away December 22, 2018 in Ferron, Ut. German was born December 18, 1937 in Bogota, Colombia to Guillermo and Josefina Morales Alvarado. He married Ma-Stella Guaqueta in 1957 in Bogota, Colombia. German had a charming personality and knew how to wheel and deal. He lived for the next deal. German was a good dad and pushed his family to be the best they could be. Dad will be dearly missed by all of his family. 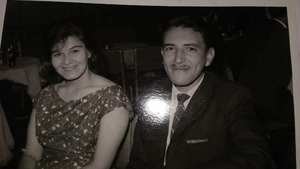 He is survived by his wife of Ferron, Ut; Daughter; Maria Victoria McGuinness of Atlanta, Ga; Sons; William (Crystal) Alvarado, of Ferron, Ut; Ronnie (LaDonna) Alvarado, of Manchester, Tn; Sergio Alvarado, of Acworth, Ga; Oscar Alvarado, of Gainesville, Ga. Also survived by 3 grandchildren, Adam, Brigit and Matthew. German was preceded in death by a Grandson, Nicholas. Graveside Services will be held Monday January 7, 2019 at 1:00 pm in the Ferron Cemetery were friends may meet at the cemetery. Services entrusted to Fausett Mortuary, Castle Dale, Ut. To send flowers in memory of German Alvarado, please visit our Heartfelt Sympathies Store. We encourage you to share your most beloved memories of German here, so that the family and other loved ones can always see it. You can upload cherished photographs, or share your favorite stories, and can even comment on those shared by others. Provide comfort for the family of German Alvarado by sending flowers. I'm so sorry for your loss. Please accept my deepest sympathy. May you find comfort from your memories, as well as from God’s word the Bible? Why do people we love die? Romans 5:12 says: "That is why, just as through one man (Adam) sin entered into the world and death through sin, and thus death spread to all men because they had all sinned." How loving of our God to promise what is found at Revelation 21:4 which says, “And he will wipe out every tear from their eyes, and death will be no more, neither will mourning nor outcry nor pain be anymore. The former things have passed away.” If you would like more information on Why we die, please visit jw.org under Publications (tracts) Can the dead really live again?